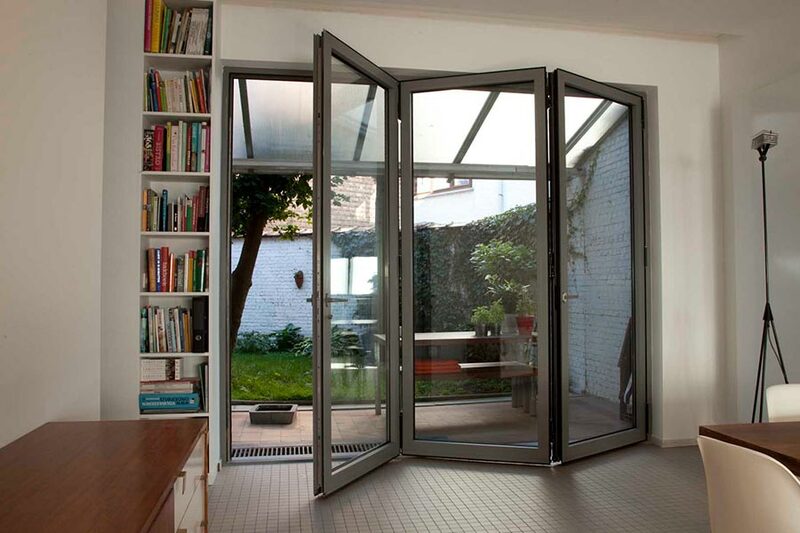 Bifold doors are the must-have home improvement product for the modern homeowner. Unlike other door models such as patio or French doors, bifolds have the ability to completely open up your home to the outside – creating especially large apertures for maximum levels of light and ventilation. 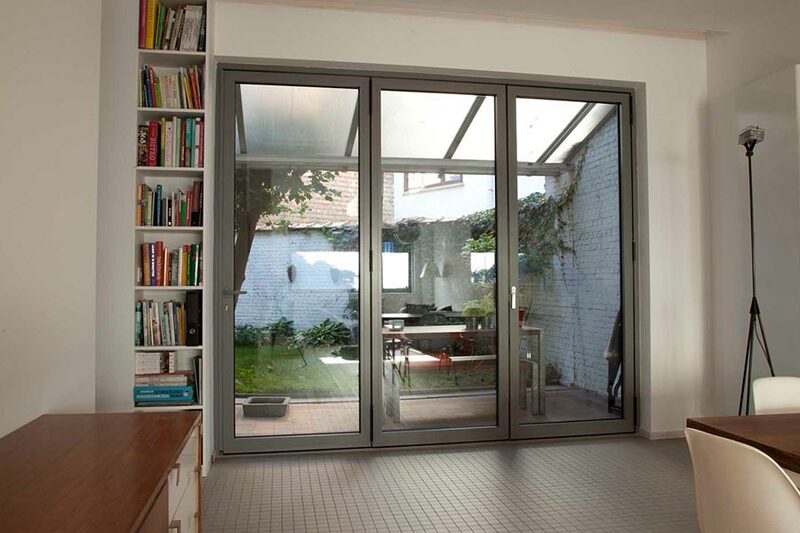 Keepout bifold doors are the perfect home improvement product for transforming your house into an inviting area for guests, as they can be installed between your living room, kitchen or conservatory to connect areas of your home for fantastic hosting spaces. With a number of door leaf configurations, you can have bifolds installed in almost any size to perfectly match your home. uPVC, aluminium or timber – Your choice of frames! At Keepout we like to offer you choice – for all of our double glazed home improvements. That’s why we offer bifold doors in timber, uPVC and aluminium. Both the aluminium and uPVC variants offer fantastic usability and operation, but for those with specific requirements or preferences we offer both systems. 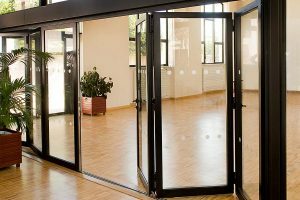 Keepout uPVC bifolding doors offer excellent usability and are comparatively cost effective compared with timber or aluminium. They are available in multiple size and opening configurations to suit all homes, and provide seamless ease of operation with stainless steel rollers. 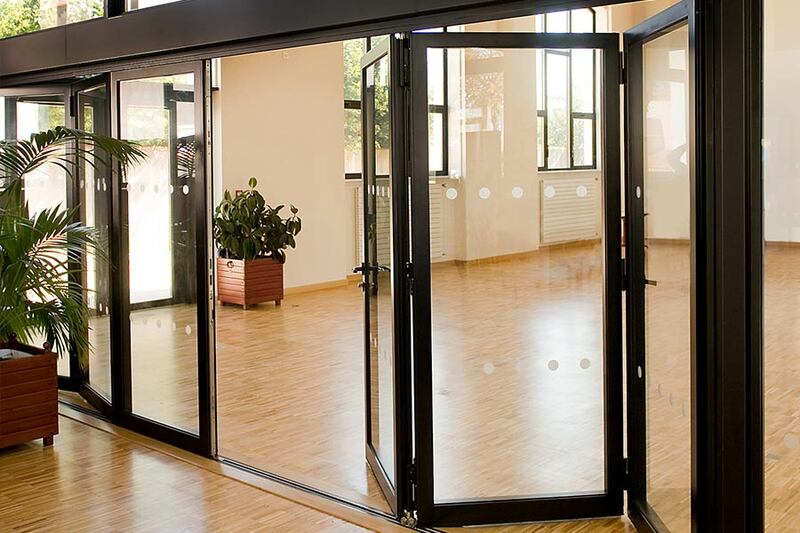 If you don’t want to open all the doors every time you use the bifold, then our uPVC bifold doors are also able to operate as a single normal door – with your choice of traffic doors. uPVC bifolds are fantastically energy efficient thanks to high performance double glazing as standard, an advanced efficient profile design, and snug seals between the door leafs when closed. You can be assured that our uPVC bifolds will help to keep your home secure by incorporating multi point locking as standard. uPVC bifolds can be customised in a wide selection of colours and hardware, so that they can be made to match your home or existing windows and doors. Colours include various wood-effect colours, as well as Chartwell Green, Cream and classic White. 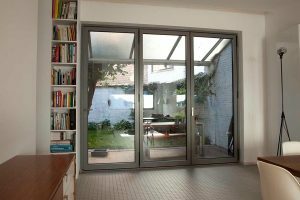 Aluminium bifold doors from Keepout offer all the fantastic features of our uPVC range, with the added performance benefits of aluminium. 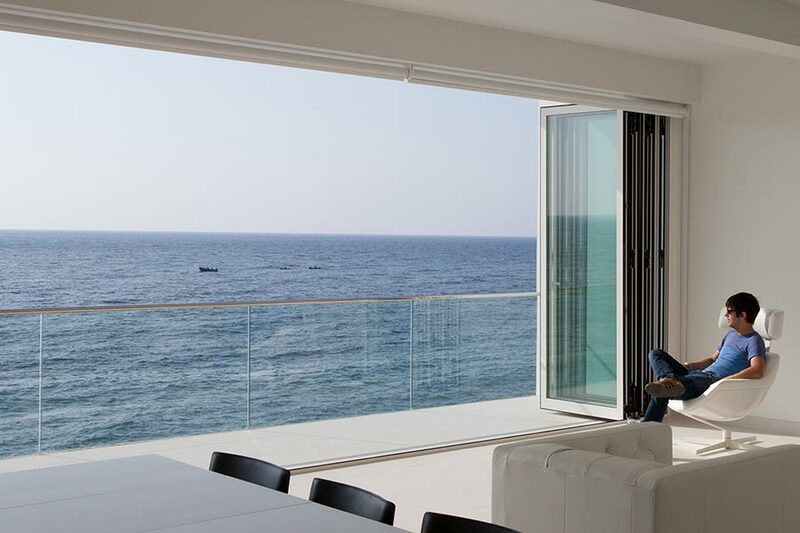 Because of the material’s strength, aluminium bifold doors offer slimmer sightlines which means they can be installed with larger areas of glass for increased levels of natural light. Aluminium is also highly resistant to rusting and corrosion for a highly durable door in even the harshest weather conditions. 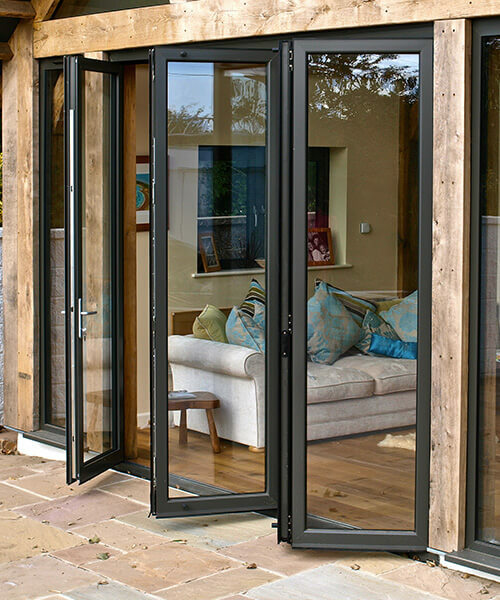 Also, with high security locks, hinges and shoot bolts as standard, our aluminium bifold doors are able to give you peace of mind that your home is safe, as well as incorporating various safety features such as finger safe gaskets to help protect your family. Our timber bifold doors can be created from a range of wood types, making it easy to match your new home improvement to the general style of your home. They are the perfect update to any living space – giving a rustic, traditional and homely feel. Timber is a naturally insulating material, meaning bifolds can significantly enhance thermal performance whilst improving aesthetics at the same time. Timber bifolds from Keepout come in a range of hardwoods, with various finishes and fine detailing available, including the Accoya wood (which lasts 50 years!) With such creative and design choice, we make it easy to seamlessly integrate your doors to the rest of your property, and can guarantee that all of our doors will continue to benefit you and your home for years to come. Disclaimer: Colours may appear different across multiple devices/computers. For a colour swatch please contact Keepout. Our aluminium bi-folds are available in a wide range of colours to perfectly compliment the rest of your home. Please browse our brochures below to see the range. Can’t find a colour you like below? You can also choose from hundreds of RAL colour options. If you need help deciding, contact us. Add strength and reduce the likelihood of damage, whether by accident or due to breaches of security. 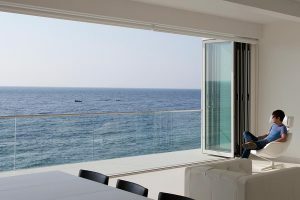 Reduce heating with energy efficient glazing, including options from glazing market leaders Pilkington – these latest designs use argon gas and warm edge spacer bars for increased insulation. Our Solar Control glass from Pilkington also helps your conservatory stay warm in the winter but cooler in the summer. Make maintenance concerns a thing of the past with glazing that breaks down dirt for a cleaner look all year round.